Process oil used for applications such as hydraulics, cutting, lubrication, broaching, honing, quenching, drilling, grinding etc., also aid as a cooling media. In other words, the heat dissipated during the process is carried away by the circulating oil. Now this oil needs to be maintained at a certain temperature range to retain its physical and chemical properties. Our oil chillers adopt the most proven design to suit specific application. In applications where direct oil cooling is not advised, we suggest a double ckt chiller, where water acts as the secondary refrigerant. 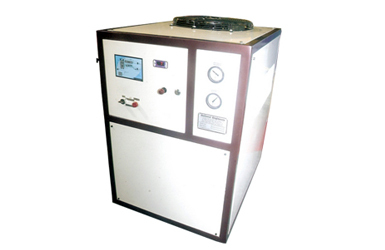 Oil chillers are available in configurations like, Stand alone, in which the oil re-circulating pump is integral with chiller and the Immersion type, in which the evaporator coil is dipped directly in to the oil sump.